Come relax in Florida Keys Paradise while you enjoy the comforts of a clean new 3 bedroom house, (not a mobile home). Central air and heat. Tropically decorated with full kitchen, vaulted ceilings, and ceiling fans in each bedroom and living room. Situated on the Oceanside in Key Largo; known for the beautiful reefs and called the Dive Capital. New screened-in front porch and back patio for year-round outdoor enjoyment. Capture cool breezes and birds singing while being pest free. Stay connected - High Speed WiFi - DSL Wireless Internet service is included. You will be minutes to the ocean with full access to a private beach area with boat ramp, boat dockage, swimming area and basketball court on Largo Sound. All conveniently located on the ocean side. For bayside boating, access is via Largo Sound thru the Adams Cut (1 mile). Plenty of parking space at the house for your car, boat, and trailer. Great for a family retreat in the heart of the keys and center of it all. Nice quiet area, absolutely no issues. House is very well laid-out and convenient to everything you need. Excellent communication. Close to water (2-3 blocks) but water access is limited to a small boat basin. We found this to be a general issue in the Keys - if your VRBO is not ON the water, access TO the water (including sights and sounds) is quite limited. Either houses are built on the water or it is totally impassable mangroves - very few public access points. John Pennekamp park is just around the corner and has wonderful water access (including 3 nice beaches and fishing) for just a few dollars a day and offers boat, kayak, diving, snorkeling, etc. A real jewel! This house was perfect! We had plenty of room for all 6 of us and enjoyed drinking coffee in the morning on the front porch. Beth was so awesome and quick to respond when I had questions. She recommended several great restaurants and we tried them all. The house had all you need and was truly a home away from home. Would definitely book again! And highway easy. Needed re-freshening. Towels were worn with bleach stains. Closets so full you could not hang clothes Refrigerator full of other person's food. Tree had fallen in back yard. Wow you did so many things. Sounds like you had a great time. Glad you enjoyed the stay and the house was central to it all. Hope you can come again. We came down with the family for some time in the Keys. this House was perfect for this. Good location, nice area, and just a good overall place to base our time out of. This house would be an excellent choice if you were looking for a boat friendly house, as the private boat launch is only a block away. House had all we could ask for, nice and clean with good kitchen and living rood. Nice bedrooms. Kids had fun chasing the little lizards around the outside areas. Glad you and your family had a great time and enjoyed staying in the Key Largo House!!! Hope you can come again. Thanks. 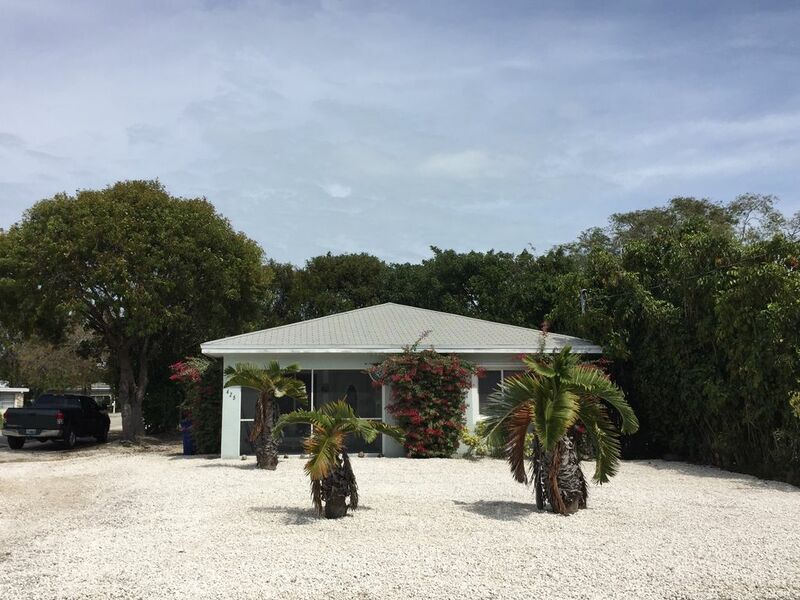 The house is conveniently next to world famous John Pennekamp Coral Reef State Park. The park has two beaches and a replica of a shipwreck in the water that is great for snorkeling or diving. You can take a glass-bottom boat ride over the reefs, take a tour snorkeling via motorboat or a sailing catamaran, as well as rent a canoe or see-through raft. Expolore on your own or join a fun group. The park has two great nature trails for hiking, a lookout point, and some of the subtropical fish can even be seen from shore. There is a nice visitor center with lookout points, trails, and a saltwater aquarium. Charter boat fishing, and diving are all nearby. Also close to Dolphin Encounter, Theater of the Sea, Bird Sanctuary, movie theater, designer shops, restaurants, and market. There is a wonderful Key Largo Community Park 3 miles south, where there are 3 pools, water park, lighted tennis courts, fitness track, bicycle and rollerblade course, and various classes offered such as water aerobics, yoga, etc. Key Largo Hammocks State Botanical site, with its unusual plants and wildlife, is one of the best places on the island for a sheltered bike ride. Birdwatchers won't be disappointed. There is 6 miles of bike path along overseas highway. The island's beauty has attracted a large number of artists whose work is displayed at local galleries. Other shops, bars, and restaurants are as varied as they are plentiful. Known as the "DIVE CAPITAL OF THE WORLD," getting into or under the water is what makes a trip to Key Largo worthwhile. You can go after the big ones with a Key Largo charter boat captain, or fish with a backcountry guide in the waters of Florida Bay or the Everglades. With only a few exceptions, everything in the Keys tends to be casual, in dress, service and food. The tropical paradise of Key Largo is only 56 miles south of Miami International Airport, but feels a world away. Nightly Rate: $115. Minimum 28 day rental. Credit cards accepted - No additional fee. No Smoking inside house. Sorry, no pets allowed due to allergies.